I have the honor to introduce to our readers a woman who have left an indelible mark on the world . She was bold, smart, posed and remarkable. Condoleezza Rice. She is the first African American woman to hold the post of Secretary of State. She was the first woman to hold the post after Colin Powell’s predecessor, Madeleine Albright. As a child, Rice was a gifted student and a prodigy on the piano, and she entered college at the age of 15. 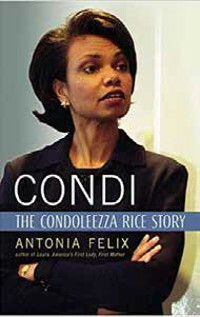 Condoleezza considered a career as a concert pianist but changed her studies to international relations, earning a bachelor’s degree. She later obtained a master’s degree in economics from the University of Notre Dame and a doctorate in international studies from the University of Denver, where her specialty was eastern and central Europe and the Soviet Union. During the administration of President George W. Bush, she was director for National Security Council and a special assistant to the president. After leaving the White House, Rice returned to Stanford University where she held the position as a provost for six years. She balanced the university’s budget and revamped the curriculum for undergraduates. Read the book, scroll through her timeline of achievements and be inspired. With the current release of her own long-awaited memoir, Condoleezza Rice is more fascinating than ever. Drawing from exclusive interviews with dozens of friends, relatives, colleagues, and teachers, as well as scores of previous articles and interviews, this thoroughly researched and detailed biography paints a compelling portrait of a born leader of resolute character who broke all barriers to excel as a black woman in an arena usually dominated by white men. From her childhood in segregated Birmingham, Alabama, where her parents fostered a love of learning and excellence at an early age, to her calling to the arts as an outstanding classical pianist, to her rise through the political ranks to the halls of power in Washington, D.C., Condi is a revealing look at the most gifted and influential woman in American political history.